Opioid addiction in the United States has escalated into a deadly epidemic. According to the Centers for Disease Control and Prevention, prescription painkillers and heroin are claiming the lives of 78 Americans every day. As a leader in an industry on the front lines in the battle against addiction, Independence Blue Cross President and CEO Daniel J. Hilferty spoke at a one-day workshop hosted by The Poynter Institute aimed at helping journalists understand this unprecedented epidemic. The event, which attracted more than 60 journalists from around the nation, was held at the National Press Club in Washington, D.C. In his remarks, Hilferty noted that Independence Blue Cross and other insurers have a responsibility, along with every other part of the health care system, to help meet the challenge of opioid addiction. He emphasized that a collaborative effort — including the health care industry, government, and the media — is needed to get better control of the crisis. 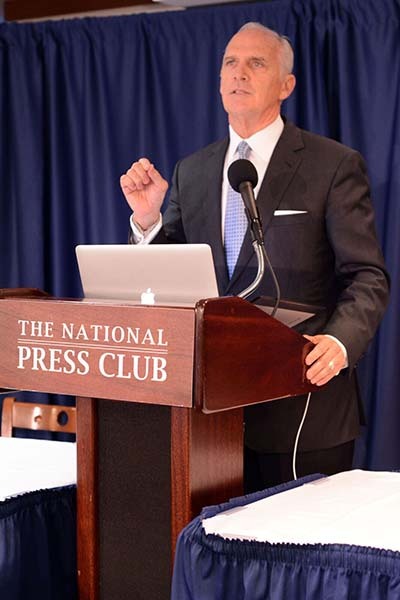 The event featured a variety of well-respected journalists, physicians, and policy expert speakers. The luncheon panel included Peter Sarsgaard, an actor and advocate who is currently working on a documentary about the heroin epidemic. Michael Botticelli, the director of the White House Office of Drug Control Policy, also spoke.